Many retirees look forward to putting their feet up after years of work, but some find new purpose and meaning at this stage of life by becoming elder-preneurs - entrepreneurs who begin businesses in their silver years. Some like Ms Helen Lim, 70, who is involved in running two social enterprises, one cooperative and a cafe, do so because they are passionate about helping fellow seniors. Others like Mr Richard Koh, 55, and Ms Audrey Lee, 54, were compelled to do so because of personal challenges. Mr Koh was retrenched from his regional business manager job in IT last May, but did not feel "ready to retire". Last November, he co-founded his online company 1°C, which specialises in handcrafted cold-brew coffees and cold teas. Ms Lee was given the responsibility of caring for her mother in 2011 after the latter was struck by accelerated dementia following hip surgery. After observing that more senior citizens were going on post-retirement holidays but were disorganised when it came to packing travel necessities, retired businessman James Lam came up with a solution. Called the "elder pouch" and launched three months ago, the kit contains 12 useful items for older travellers. These include a distress alarm, a fever strip, a pill box and an emergency call list. At pharmacies, he found that there were first-aid kits, but no package was geared specifically for older travellers. After gathering ideas for what the pouch should contain and getting a grant from social enterprise Silver Spring, he flew to China to find a factory to produce the pouch. His contacts from the time he was doing business, importing and exporting items from China, came in handy. The green, zippered pouch opens to reveal multiple compartments. The items inside are either sourced from overseas or made by the factory in China. Some of the first run of 300 pouches have been given to friends for feedback. Eventually, he hopes to sell the pouch to travel companies, especially those that cater to the elder travel market. He is looking to price the pouch at $25, which he says is just a few dollars above its cost price. Meanwhile, he is starting work on another project - elder-safe shoes that will help to minimise falls among the elderly. "I always believe in making plans a reality," says Mr Lam, who is married with two adult children. "I don't want to just learn more and upgrade my skills, but also to actually do something meaningful." There is no stopping serial elder- preneur Helen Lim, a sprightly and cheerful 70-year old. I really want to help seniors. I believe in doing good and in doing well. She became an entrepreneur for the first time when she was 62 and has since gone on to co-found cafes and two other social enterprises. The former human resource director and civil servant set up social enterprise Silver Spring in 2009, just four years after her retirement in 2005. She had noticed that many people lost their sense of identity and self-esteem after retiring or getting retrenched. Silver Spring helps to find re-employment for mature job-seekers. That year, she also set up Chatters Cafe in Parkview Square near Bugis and staffed it with employees all aged 50 and above. "It was an opportunity for Silver Spring to showcase what it did, for us to walk the talk," she says. As she conversed with her fellow seniors, she realised many of them did not want to spend their golden years working. Instead, they wanted to travel. The problem, however, was that they could not keep up with the pace of travel on commercial group tours and felt more tired than refreshed after their trips. So she banded together with like- minded seniors and founded Silver Horizon Travel Co-operative in 2012 with the help of the Singapore National Co-operative Federation. Formed in 1980, the federation aims to promote and develop cooperatives as sustainable enterprises. Silver Horizon Travel works with tour agencies to come up with customised, senior-friendly group tour packages. To become a member of the cooperative, people pay $50, which entitles them to a share of the cooperative, and an administrative fee of another $50. Membership is open to anyone aged 40 and older. It has organised 45 trips to date, an average of nine trips a year. Destinations range from Johor Baru to Russia. This year, members have gone to Taiwan and Hokkaido, Japan, and there are two fully subscribed upcoming trips to Okinawa, Japan, and Vietnam later this year. In 2012, she opened another Chatters Cafe in Ren Ci Community Hospital in Novena. That opening also marked the end of Chatters Cafe in Parkview Square, which she closed because of rising rentals. Even with a full plate, Ms Lim continued to be sensitive to the needs of fellow seniors. To help those who were staying at home and waiting for time to pass, she co-founded Silver Sparkles in 2014, a social enterprise which matches senior citizens with part- time jobs. Ms Lim, who is married with an adult son, is confident that this is not the final senior-focused project she will be involved in. The self-confessed champion of "silver talent" says that many of them have ideas and these are birthed over cups of coffee at Chatters Cafe. She says: "I really want to help seniors. I believe in doing good and in doing well." WHILE most Singaporeans view our nation’s ageing population with a sense of gloom, Ms Helen Lim sees it as a “silver reservoir” of glittering untapped resources and opportunities. “When you recognise the stability, maturity and wisdom that come with age, you will realise that seniors are not a burden but an asset to society,” she explained. This led Ms Lim to take the leap of faith after her retirement and venture into businesses catering specifically to the silver market. Today, the 70-year-old social entrepreneur is not only the founder and chief executive of Silver Spring, a job matching and recruitment service for mature workers, but also manages two cafés run by seniors and a co-operative that customises travel packages for seniors. Four months later, she received a call from Singapore Health Services (SingHealth) inviting her to be part of Silver Connection, a programme that helps local healthcare professionals get re-employed. Her job was to get retired nurses to return to the profession, and it was through her interactions with these nurses that she realised that retirement was far from what she had imagined it would be in her mind. “They shared with me that the first year of retirement is very fun because you don’t have to wake up early, you just do whatever you want… but after the first year, it gets boring. How much coffee can you drink with your friends? How much shopping can you do before you spend all your retirement money? That was a moment of awakening for me,” she said. Ms Lim’s three-year stint at Silver Connection eventually motivated her to become an avid champion for the re-employment of seniors. Understanding the challenges faced by mature job seekers, she saw the need to provide them with coaching and guidance. So, when her contract with SingHealth ended in February 2009, Ms Lim decided to tap on her personal connections and coaching skills to help mature workers get re-employed and remain financially independent. This marked the beginning of her entrepreneurship journey. Besides launching Silver Spring to help seniors re-enter the job market, Ms Lim also set up her first café in a move to take the lead in hiring retirees above the age of 55. From the chef to the service assistants, the café is run entirely by an all-seniors team. Taking the lead: The employees whom Ms Helen Lim hires for her cafés are above 55 years old. As a veteran HR practitioner of over four decades, Ms Lim never anticipated that she would become her own boss after retirement. Labelling herself as an “accidental entrepreneur”, she confessed that she was mentally prepared to lose all her investment if the café business did not work out. Indeed, running a business has not been all that rosy. After three years of operation, the café at Parkview Square had to be relocated to Ren Ci Community Hospital due to rising rental costs. Ms Lim also faced issues such as staff turnover. “There were times where I thought of giving up… but I knew that if I did, the rest (of my staff) would lose their jobs too,” she said. As such, Ms Lim stuck to her social mission, constantly thinking of ways to help seniors while making her businesses more viable. Her passion and perseverance eventually paid off as she opened another café at Wilkie Edge Shopping Mall. Where do these business ideas come from? Ms Lim gets her inspiration from interactions with seniors. Once, she was chatting with friends on the topic of travel and many of them complained about how tour agencies’ itineraries were too packed and tiring for seniors, as well as how trips with younger companions would include visits to theme parks that they could not really enjoy. Ms Lim saw this as an opportunity to help address the travel needs of seniors. In 2012, she started Silver Horizon, a co-operative that works with tour agencies to tailor travel programmes for seniors. Five years on, Silver Horizon’s members have grown to over 380 seniors. Even as Ms Lim expands her business ventures, she remains focused on her social mission of helping seniors. She is optimistic that her work will change Singaporeans’ perceptions of seniors. “Once we disassociate ageing with dependency, we will be able to see the true value of the silver market. It’s not a silver tsunami; it’s a silver reservoir of resources, waiting to be tapped,” she said with a smile. Mr Henry Lim, 81, hangs out by the swimming pool and tennis courts four to five days a week, but instead of lounging around, he is working. A facilities assistant at Mandarin Gardens condominium in Siglap, he registers residents who want to use facilities such as the gym, swimming pool and tennis and squash courts. “I like my job because it lets me meet people. I treat my colleagues and the residents like my friends and I like to make friends,” he says. Like him, many seniors are working beyond retirement age – some into their 80s and 90s. While some need the money to survive, others work to stay mentally and physically active. Currently, the retirement age is 62, but employers must offer re-employment to eligible staff who turn 62, up to the age of 65. From July, the re-employment age will be raised to 67 to provide more opportunities for workers who want to continue working as long as they are healthy. The workforce in many countries is getting older and Singapore is no exception. According to Ministry of Manpower figures, the number of employed residents aged 70 and older has risen from about 16,000 in 2006 to about 43,000 last year. The Sunday Times found six people aged 80 and older who are still working. Among them are Madam Goh Gwek Eng, 93, a McDonald’s employee; Mr Seng Lee Fong, 90, a part-time bartender at Tanglin Club in Stevens Road; and Madam Chan Woh Hoong, 88, a kitchen assistant with restaurant chain Han’s Cafe, who joined as a cleaner about 30 years ago. The seniors who agreed to be interviewed said they did not need the money and chose to work because they wanted to stay active. Non-governmental organisations, however, highlight that some elderly workers might, in fact, need the income to get by. Ms Julia Lee, director of the department of social work at Touch Community Services, says: “From our observation, there are many seniors who are still working because they may need the money to supplement their little savings and to keep up with the rising costs of living.” She adds that many of them work as coffee shop assistants, hawker centre cleaners and security guards. Member of Parliament Seah Kian Peng, who chairs the Government Parliamentary Committee for Social and Family Development, tells The Sunday Times: “There will be elderly who work because they actually need to, but prefer to say they are doing it not for money, but to keep themselves occupied. “Some give their answers because of pride. Some are indeed not being supported by their children, but prefer... not to approach them for help. Figures from the Ministry of Social and Family Development suggest that the number of needy elderly in Singapore is rising. From financial year 2012 to 2015, the number of elderly households – with main applicants aged 70 and older – receiving short- to medium term assistance from ComCare rose from 1,627 to 2,464. ComCare’s short-to-medium term assistance provides financial help for a temporary period to individualswho are unable to find work for some time. Over the same period, the number of elderly households receiving long-term assistance from Com- Care also rose, from 2,310 to 2,585. Such assistance – also known as public assistance – helps people who are permanently unable to work and support themselves, as well as have limited family support. She adds: “I am very happy interacting with customers – finding out what they want and helping them. Doctors say that from a medical, standpoint, there is no research to suggest an age at which it is advisable to retire. Whether one should continue working depends on one’s physical and cognitive functionality, and the type and intensity of one’s work, they say. Associate Professor Reshma A. Merchant, head of National University Hospital’s division of geriatric medicine, notes that of people aged 65 to 69, only 3 per cent are considered “frail” and 63 per cent are considered “robust and healthy”. This is based on her research on the prevalence of frailty in the western region of Singapore. Of those aged 75 and older, only 9 per cent are considered “frail”. One of them, in his 90s, even learnt a new language, she adds. While doctors generally agree that employment contributes to better physical, cognitive and psychological well-being, some qualify that such positive effects are not exclusive to working. 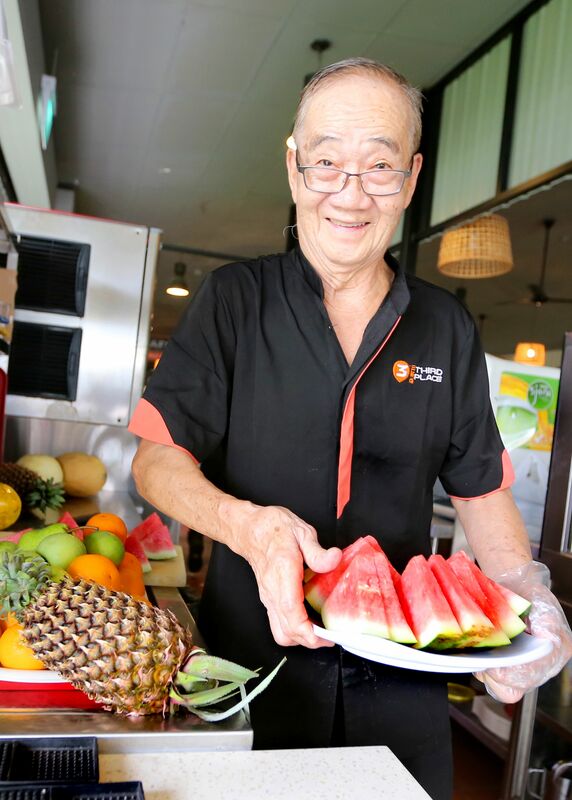 Since September 2015, Singaporean Koh Kow Yin, 83, has been working at Third Place cafeteria in Tuas. He is a full-time catering assistant there. "All my friends are dead or retired. Many ask me why I am still working. I tell them it just makes me happy. "I am not short of money. But if I do not have a job, I will have nothing to do and would feel so restless. "I currently work five hours a day, from Monday to Friday. I cut and prepare fruit - such as watermelon, papaya and starfruit - for customers. "This cafeteria is operated by Select Group, a company that provides food services, and I also prepare fruit platters for other staff cafeterias under the group. "I am a grandfather of three and have two sons, aged 60 and 59, and a daughter, 57, with my first wife who died six years ago. "My second wife, Madam Ong Ah Sim, 65, is a dishwasher in the same cafeteria as me. "We live in a one-room Housing Board flat in Boon Lay. "Since leaving school at Primary 2, I have always been employed. "In the 1950s and 1960s, I worked at an army camp canteen. In the 1970s and 1980s, I was a mechanic, fixing and maintaining machinery used for carpentry and aeroplane parts. "When I turned 67 in 2001, my then-employer let me go because its insurance no longer covered me. "I then became an office cleaner for 14 years, after which I was again let go because of my age. "That was when I came to Third Place for a walk-in interview and was hired. "I am back to preparing food for customers. And I like it. "I guess whether to work or not really depends on whether it makes you happy. "I think most people my age would not want to work. But for me, being employed helps me stay active and keeps me occupied. "My eyesight is poorer than before and my movements are slower, but I have no health problems. So as long as my body lets me, I want to keep working." SINGAPORE — At Chatters, a small café in the lobby of a hospital, the staff frothing cappuccinos and managing the register aren't your typical young baristas. That's because every employee must be at least 55. "It keeps my mind moving," said Sally Chung, 72, a retired accountant, who manages the café and does the books. The café's age requirement reflects a demographic trend this city-state of 5.6 million people is trying to confront: the population is getting old — fast. In 2015, one in eight Singaporeans were over 65. By 2030, that number is projected to double to one in four. The coming "silver tsunami" will make Singapore's population one of the oldest in the world. The country already has one of the world’s longest life expectancies at 83 years old. Singapore is trying to tackle the problem of skyrocketing healthcare costs, a declining birth rate and fewer younger workers with a comprehensive plan that may provide ideas for countries like the United States that face their own graying futures. The percentage of Americans over 65 is projected to rise from 15% of the population to 24% by 2060. That's 98 million people who will be draining ever more government health and retirement benefits that a smaller percentage of workers may be forced to shoulder. Last year, Singapore launched a $2.2 billion program with over 70 initiatives on health, transportation, education and housing for the elderly. Subsidizing skills retraining for older workers is one key part of the plan. Another is called “re-employment.” While retirement age is 62, if an employee wants to keep working, the company is mandated to keep him or her until 67. The scope of the job can also change, including less hours for lower pay. Helen Lim, founder of Silver Spring, an employment agency for older workers, said employers should recognize that as the population ages, they’ll face a shrinking pool of younger candidates. Lim, 69, who also founded Chatters café, said job redesign is essential for companies hiring older workers. At Chatters, she's added larger fonts on cash registers and smaller deliveries to reduce the amount of lifting. Singapore’s largest supermarket chain, NTUC Fairprice, has also focused on employing older workers, with roughly half of its employees aged 50 or over. They’ve added flexible or part-time hours and created positions for seniors such as customer service representatives, said Tan Kwang Cheak, the chief human resource officer. “This practice allows us to draw on a wider, more robust and diverse pool of talent,” he said. Singapore's unique position is increasingly becoming a source for other countries to study, said Bob Aubrey, chairman of the human resources committee at the European Chamber of Commerce. For some people in Singapore, working into their golden years is necessary. It’s common to see people in their 70s and 80s doing physical labor such as clearing tables in food courts or sweeping floors at offices. SINGAPORE — In the current uncertain economic climate, where nary a week goes by without news of yet another company laying off staff, it can be worrying for jobseekers already finding it tough to land an offer. According to Ministry of Manpower data for the third quarter of last year, nearly 55 per cent of Singapore residents made redundant in the previous quarter were able to find a new job within six months. This means that 45 per cent take longer than six months to land a new job. If it is difficult for the average jobseeker to land a job, much less for working mothers seeking flexible working arrangements, senior citizens competing with younger men and women who are also looking for work, or young adults with zero working experience. While there are many major online hiring portals such as jobsDB and LinkedIn that have helped many find their dream jobs, for jobseekers with specific requirements, finding the right job can be difficult. Over the past couple of years, though, a new breed of employment search portals have emerged to provide more customised platforms for senior citizens, mothers and other niche groups of workers. Championing the employment of mature jobseekers is Silver Spring, which helps professionals, managers and executives (PMEs) between the ages of 40 and 70 consider re-career options or resume their careers. The social enterprise was founded by Ms Helen Lim, 69, who set up the jobs portal segment in 2012. “In more recent years there has been better opportunities for the more mature jobseekers....aligned with various measures the government has taken to encourage the employment of seniors. Silver Spring job portal started mainly to invite mature PME jobseekers (those restructured out of organisations) to see how we can help them get ready for their next career,” Ms Lim said. Candidates on their portals generally have a diploma as a minimum qualification, while many have degrees and post graduate qualifications. Some have also had experience working in multi-national corporations. “There is also a unique group of school-leavers in their mid-50s onwards who have grown well in their organisations to managerial levels. This group, when retrenched, faces more challenges getting another corporate job with no paper qualification to support them,” Ms Lim said. The website, which now has close to 2,000 candidates, offers full-time, part-time and contract positions across a wide range of roles including, managerial, senior accountants, security supervisors, senior executives and senior IT business analysts. “So far, we are managing well with monthly salaries in the S$5,000 to over S$10,000 range on full-time basis. For admin and short-term contracts, we also manage job roles with salaries in the S$2,000 to S$3,000 range,” Ms Lim said. For working moms, Mums@Work strives to help women find a balance between being a mother and being part of the workforce. It was set up by Mrs Sher-Li Torrey, 38, who had found it difficult to find a job offering the kind of flexibility she needed after she became a mother. The site now has close to 26,500 strong members, with about 93 per cent comprised of Singaporeans/Permanent Residents. “Women (in particular mothers) tend to be the caregivers in families. For this reason, their desire to have work-family balance would be greater than some other groups. Mums@Work is a portal specifically for mothers who want work-family balance. Only flexible work arrangements are accepted (part-time, contractual, freelance, project basis, work from home, flexible hours),” said Mrs Torrey. The website offers job listings ranging from finance to admin, marketing, operational, and legal. All positions require a minimum criteria of diploma qualifications. Meanwhile, Glints is a site that caters solely to young adults looking for internships. Founded in 2013 by three youths who started the site as a side project, the portal “accidentally” grew into a business because of demand from the market. The portal offers internships and entry-level to junior positions for all job categories. The website has a 75 per cent success rate in matching the right candidates to companies in four weeks. In the past 12 months, its user base has grown 7.5 times. The website recently announced a partnership with Ngee Ann Polytechnic, a move which will allow the 16,000 students in the polytechnic to gain access to their site, whilst allowing local companies easier access to a greater pool of talent. “We realised that the real problem that young people faced is not that they cannot find internships and jobs, but that they don’t really know what career paths they want to take, and what skills sets they require,” said Mr Oswald Yeo, co-founder and CEO of Glints. The portal, hence, serves to help young people explore different career paths and guide them to acquire industry-relevant skills. “Applicants benefit from the live chat consultations on the platform for career guidance and special recommendation to good opportunities,” Mr Yeo added. Over at Singapore Part Time Jobs, the platform provide jobs for those seeking ad-hoc offers. Job applicants range from the age of 16 to retirees. Founder Mr Gabriel Dipankar Subba, 43, created the site after the birth of his daughter. He wanted to find a temporary job that would allow him to spend more time with his child. He felt that it was “cumbersome” to look through mainstream portals as they catered more for full-time work. “The total number of companies we have served over the years is approximately 500. They are mostly small companies, but we have also served well-known organisations and start-ups like Killiney Kopitiam, The American Club, Uber, Kumon, Mind Stretcher, Sing Gas, Suntec, Smoothie King, Madame Tussauds to name a few,” Mr Subba added. 56-year-old Jonas Tan is in the final stretch of his earning potential. But poor health has hit his family and his savings may not be enough. Undaunted, he finds out what he needs to do to take care of his family and still enjoy a comfortable lifestyle. Do mature PMEs in Singapore have unique characteristics? To better understand this so that programs and policies can be tailored more effectively, Silver Spring collaborated with several government agencies in a workshop in September to develop persona profiles that represent PMEs in their 40s, 50s and 60s. Areas of discussion included motivations for seeking employment, family situation and challenges. Few Singaporean professionals have had the opportunities and exposure that Tan Chin Hwee has had. In the span of a 36-year career in the manufacturing and aerospace industries, this senior finance executive has worked with Fortune 100 companies, such as General Electric and Honeywell and has managed their financial operations across the Asia Pacific with turnovers of over US$1billion. Fresh out of university at age 24, Chin Hwee’s joined General Electric Singapore as a cost specialist. Five years later, he was transferred to General Electric’s Aviation division where he performed outstandingly and became the Chief Financial Officer (CFO) of the aviation plant at the relatively young age of 31. However, the work was strenuous. “Those were the days before computerization really took off. We had a very lean finance department to run a US$200 million business”, said Chin Hwee. The shortage of resources forced Chin Hwee to work smart and continually find novel ways, such as Six Sigma solutions, to increase productivity, reduce costs and generate cash for the business. Over the years, he became well versed with every aspect of the business, from manufacturing to servicing, regulatory requirements and human resources. Although headhunters regularly knocked on his door, Chin Hwee chose to stay with General Electric for a good 23 years before further developing his career at another company. Even then, it was only because his former boss and mentor, who was then with Honeywell, asked him to go over to help. Chin Hwee was appointed CFO of the operations in Singapore where he quickly achieved productivity gains by streamlining the finance operations. At 49, Chin Hwee was promoted to become Honeywell’s Regional Financial Controller for the Asia Pacific covering 15 plants and more than 60 finance staff in China, Philippines, Malaysia, Singapore, Indonesia and Australia. When he turned 60 , Chin Hwee was asked if he would consider moving to Shanghai to continue with his regional financial control responsibilities. Although he was grateful that the company continued to value his contributions, Chin Hwee did not want to uproot to another country. However, as his company was moving most of its regional operations out of Singapore, there was no alternative role for him. “This became a major turning point in my career as well as my life,” he shared. “I had worked for almost 40 years and that was what I knew. I had learnt so much in business finance all these years and I felt that I had a lot of experience to share and to help others in their businesses. Chin Hwee also had to deal with the prospect that he would go from a healthy regular salary to no income. “Even though I had built up a nest egg for retirement, I was not prepared to dip into it yet. I still wanted to be productive and draw an income”. The idea of retiring was quickly discarded. Instead, Chin Hwee started making preparations even before he left Honeywell. He signed up for courses at the Singapore Institute of Directors to learn about how to be an independent member of a board of directors. He networked with executives he met at his courses to understand what kind of financial advisory services small and medium enterprise companies were in need of. A friend also introduced him to Silver Spring. After leaving his company, Chin Hwee found it difficult to secure an independent directorship appointment, which he had hoped for. Instead of feeling despondent, he took up an offer that Silver Spring identified for him, to work part-time as the CFO for a start-up technology company and consultancy. Two months into the role, he had made such a good impression on the company that word spread. Silver Spring also put Chin Hwee in touch with another SME that needed finance consultancy work and he clinched a project to be their business advisor in transforming their finance system. Today, at 61, Chin Hwee, works 3 to 4 days a week and spends the rest of his time with his family and hobbies. “This is an ideal arrangement for me”, he explains. “Having worked with big companies all my life, I am enjoying the refreshing change of flexible hours and working with smaller businesses in an advisory capacity. It is very fulfilling to be able to use what I have picked up in my nearly 40-year career to help these start-ups avoid unnecessary mistakes and also achieve more by working smart. At the same time, I am constantly updating myself in the finance industry”. His encouragement to mature PMEs is to keep their craft relevant by continually learning and be willing to try working in environments that may be different from what they have been used to. “I had not realized that there are different opportunities for me to continue working until Silver Spring introduced me to these businesses. When others see that you can add value, they will respond positively”, Chin Hwee concludes. SINGAPORE — Taking stock of yourself — that is the first step for seniors looking to re-enter the job market, said Ms Helen Lim, Managing Director and founder of Silver Spring. Another major milestone for Silver Spring in its mission! 20 July 2013 saw the launch of the BRP Job Hub, an initiative by NE CDC - supported by Punggol Community Club and operated by Silver Spring. With the extension of the recruitment services to the heartland, the social mission of re-deploying our Singaporeans and permanent residents to the workforce is not only enhanced, but has becomes significant and impactful to the community. The interns, volunteers and the core Silver Spring staff, all had a tiring, but fulfilling and enjoyable day to promote the additional avenues for finding jobs for the members of the community. You can now watch the full episode again on the web. What distinguishes a social enterprise from other businesses? A passion to address a social issue and turn them into opportunities. What determines a successful social enterprise? The right mix and balance of doing well and doing good. It's about doing business with a big heart. After over a month of filming with Channel NewsAsia (CNA) for a series titled Social Inc, the episode featuring Silver Spring is airing soon! Watch how Silver Spring takes on the challenge of running a fledgling social enterprise with some mentorship from a CEO of a global search firm. Watch the backstory here and catch the full episode this Sunday, 17 March at 9:30 pm on CNA. Also check out other social enterprises featured on the Social Inc web site. Work no longer feeds your mind, stirs your heart, and nourishes your spirit? If 'yes' is your answer, you may be filling empty-employed. Perhaps it's time you consider ReCareering! Find out the what, when, and how of ReCareering in this article written by Helen Lim.